We've changed the way we collect your rubbish from 6 November 2017 - most households changed to a rubbish collection every other week, in a wheelie bin or re-usable rubbish bag provided by us. 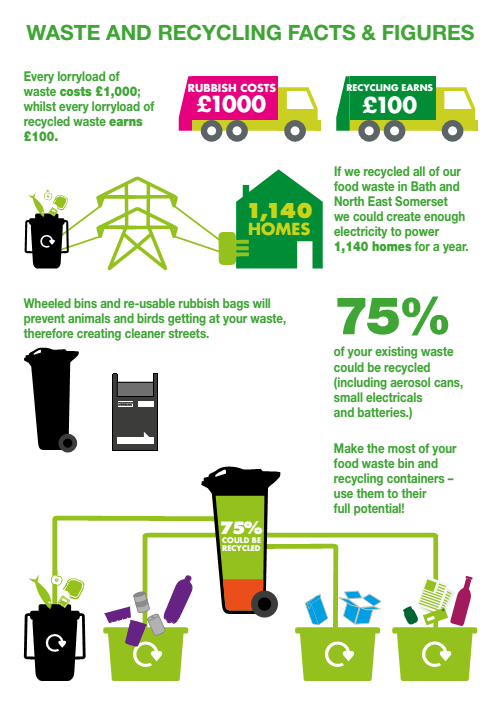 Recycling and food waste continue to be collected weekly. Check what you can recycle. Why has the service changed? Please read the information included in the welcome pack delivered with your wheelie bin or reusable rubbish bag. an 8 page leaflet (see copy above) with full information on how to use the new service and a reminder of all the things you can recycle each week. You can also print a copy from the documents section on this page. Please make sure you read over 30 FAQs about the changes. Figures show that locally, the average black plastic bin bag is still being more than half-filled with recyclable items such as food – which is leading to ripped bags spilling waste onto the streets. Providing wheeled bins or gull-proof sacks across the authority will help to reduce the amount of rubbish on the streets – particularly food waste –and will help tackle the scavenger problem. As 75% of household waste can be recycled, the actual volume of rubbish being placed in the black bin can be reduced significantly for most local households. The experience of families elsewhere and the Council’s own tests show that the average household which recycles all of their waste would still have space left in their bin by collection day. Are you concerned about the cleanliness of your neighbourhood and want to do something about it? Please go to Friends of our Street for advice and downloadable materials to help keep your neighbourhood clean and tidy. 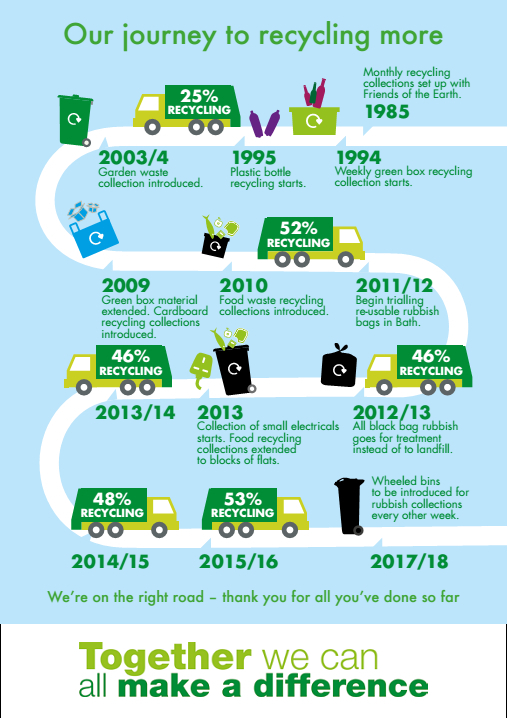 Read about the facts and figures behind our recycling. Follow our journey to recycle more.